Genetic make-up could be to blame for the beer belly. Scientists have found that men with a certain gene variation have a tendency to get a flabby stomach. The men were more likely to become overweight and to put on fat around their abdomen. Experts say other factors - such as diet and exercise - also play a role in obesity. 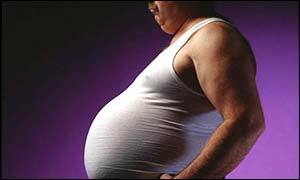 It appears, however, that some men may be genetically programmed to get a beer belly as they get older if they lead an unhealthy lifestyle. The culprit seems to be a substance called angiotensin-converting enzyme (ACE) which helps regulate blood pressure in the body. Studies in the laboratory suggest it might also play a role in the growth of fat cells. A team led by Pasquale Strazzullo of the University of Naples looked at several natural variations in the gene that are found in healthy men. They found that one genetic variant (polymorphism), known as DD, is linked to developing fat around the stomach. It seems to predict which men will put on weight and develop beer bellies as they grow older. "DD homozygosity was associated with larger increases in body weight and blood pressure in aging persons, as well as with higher incidence of overweight," they write in the Annals of Internal Medicine. The research was part of a large heart disease study of 959 men, aged between 25 and 75 years old, who work for the Italian company Olivetti. Participants in the Olivetti Prospective Heart Study were weighed and measured, and their gene type was determined with a blood test. Men with the DD genetic sub-type were more than twice as likely to become overweight over the course of two decades than those with a different gene type. The authors say the study does have limitations - it only looked at Italian men and may not apply generally. Scientists acknowledge that more research is needed to unravel the relationship between particular genes and obesity. As genes are identified and their roles better understood, so is the fact that obesity is a chronic disease, said a spokeswoman for the American Obesity Association. She told BBC News Online: "Understanding genetic predisposition to weight gain is an essential step in defining obesity prevention and treatment strategies, and in arresting the stigma that obesity is always an individual's fault."